← Self Checkout with a Chromebook! 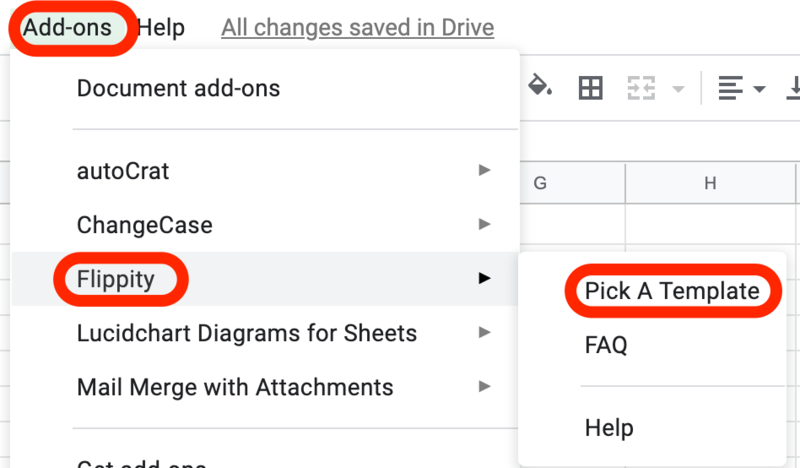 OK – to be fair, you need Google Sheets and the Flippity add on, but still, this is pretty handy, easy to do and works really – really well. I’ve seen a couple of articles about this on the web but I’m going to go a little deeper and walk you through from start to finish. In this example, we will be doing some language learning though I can think of this being used for math problems and vocabulary as well and much, much more. So let’s get started. As you can see, I have 10 English words about the Spring season. I could look these up, but I will let Google Translate do it for me. In cell B2 I will type this formula which will translate it from English to Spanish automatically. So let’s break this down. 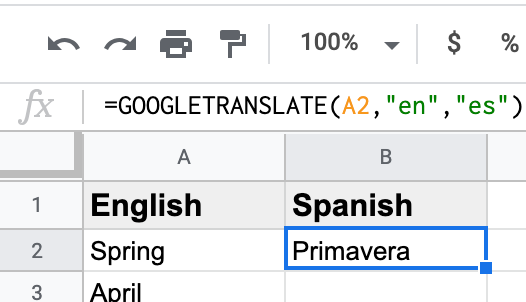 =googletranslate will let Google Sheets know that it needs to use Google Translate – pretty straight forward. Don’t forget the comma! A2 tells Google Sheet where the word is that needs to translated. “en” (yes you need the quotations) lets it know what language the original language is. So this is what it will look like. Now all we need to is move your mouse to the bottom right hand corner of cell B2 (it should turn into a + sign) then click and drag down like in the GIF below. 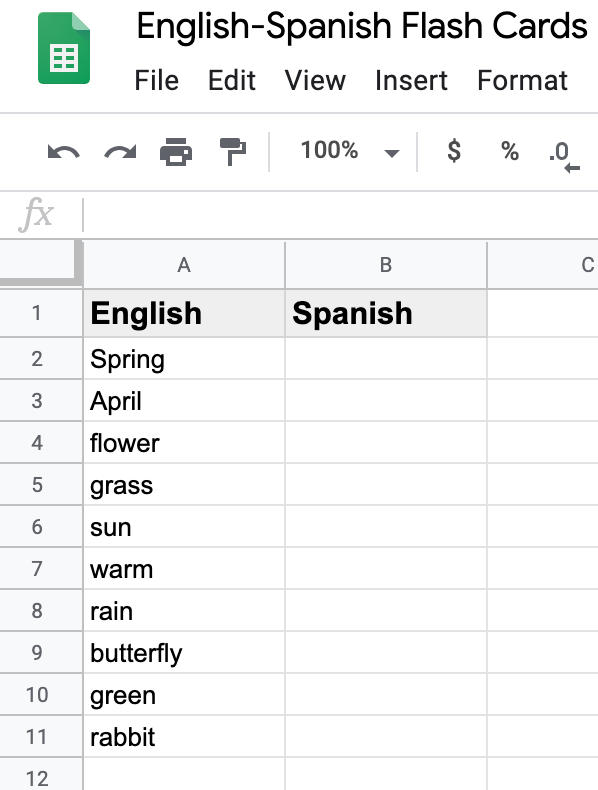 Google Sheets (any spreadsheet program really) understands the pattern and automatically replicates the googletranslate formula all the way down properly changing the cells as needed. The next thing we need to do is get the Flippity add-on. To do this open a blank Google Sheet and then click on Add-ons from the menu bar. Then select Get Add-ons. 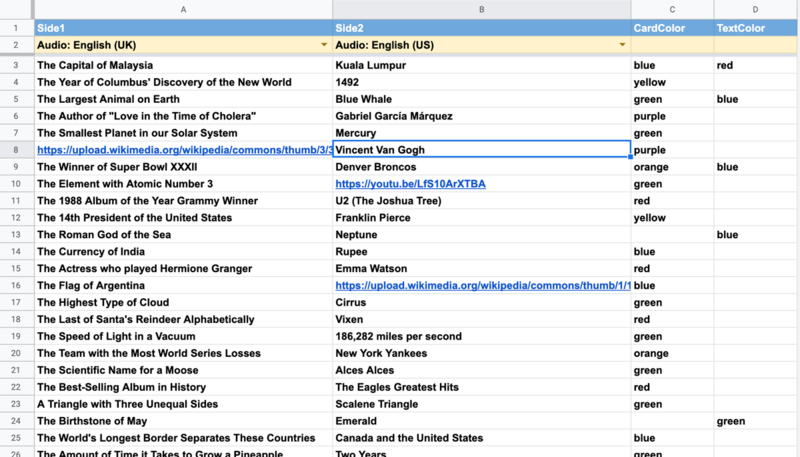 A new window will pop up and from here search for and add Flippity to Google Sheets. You only need to do this once. 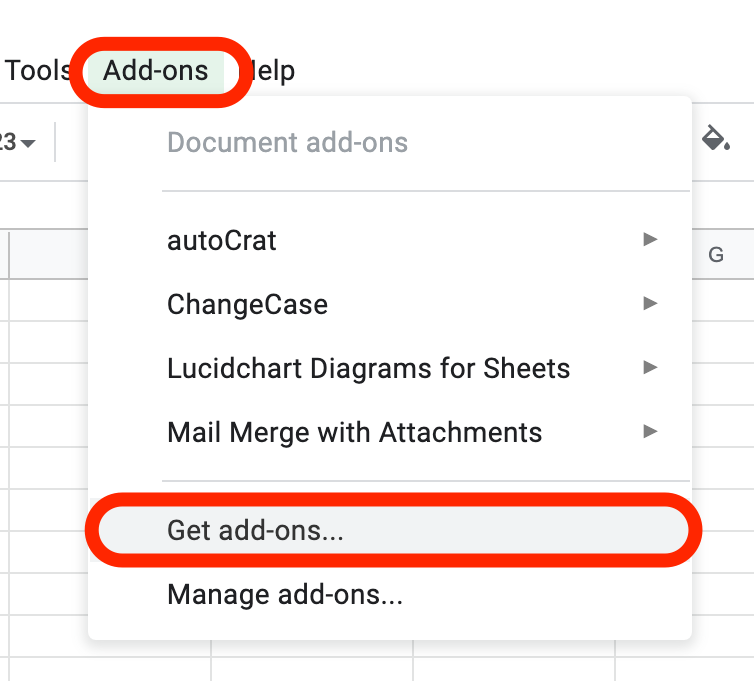 After you’ve added it, every new Google Sheet you open will have the ability to utilize the Flippity add-on if you want it to. To activate the Flippity add-on, click on Add-ons and select Flippity and select Pick a Template. The template you will want to chose is, surprise – surprise, Flashcards. Go ahead and click Use. 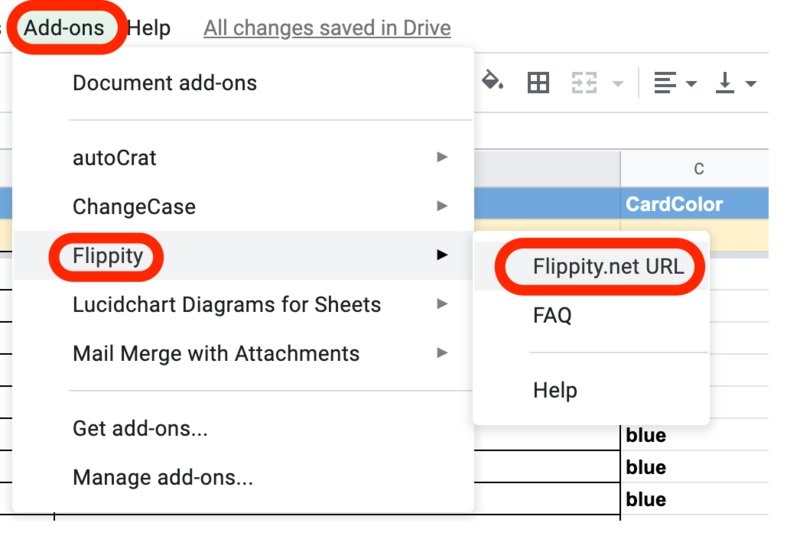 Flippity will do some magic and then create a new worksheet with whole bunch of info that you do NOT want. Do not be alarmed. This is merely an example of how and where to put your data. So go ahead delete all of their information and copy and paste your data. Your data will be on another sheet (probably called Sheet 1 like mine). You can find this at the bottom of the page. You may also notice that you can customize the flashcard color and the text color. This is not necessary but a nice touch. Here is my finished flashcard spreadsheet. To get to the flashcards, click on Add-ons, select Flippity and then select Flippity.net URL. A pop up will appear with a web address. You can click that and it will take you to your very own custom made flashcards! You can also check out my flashcards and get your Spanish learning on! You can do this on Quizlet, but I find the translation part much faster with Google Sheets and with the URL you can easily share out your flashcards with multiple people and there is no need for an additional account (though you can sign into Quizlet with your Google ID) tp sign into. All in all – this took me around 5 minutes to make and I think you can make this as large or as small as you would like – have fun with it! It could be a good activity for a class or a group of students to help study and quiz one another. 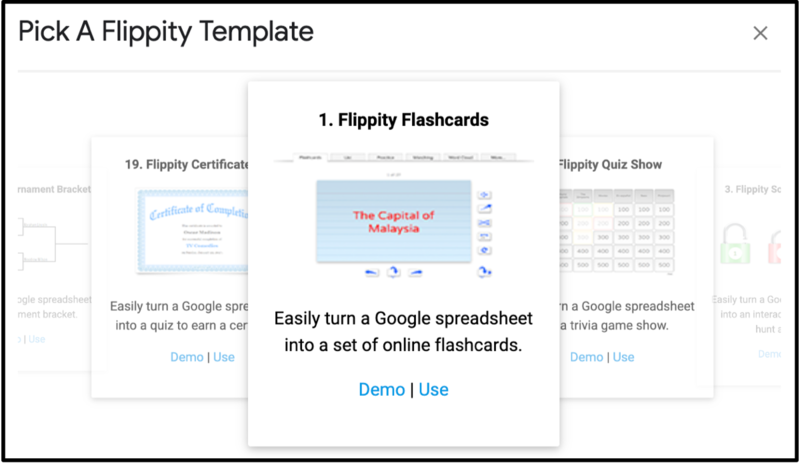 Flippity can also make some other cool things like a Jeopardy so be sure to explore and see what else you can do with Google Sheets and Flippity. When it comes to Google Sheets, small mistakes in the formula can lead to big errors so it is always good to double check the translation and make sure that it is indeed correct. 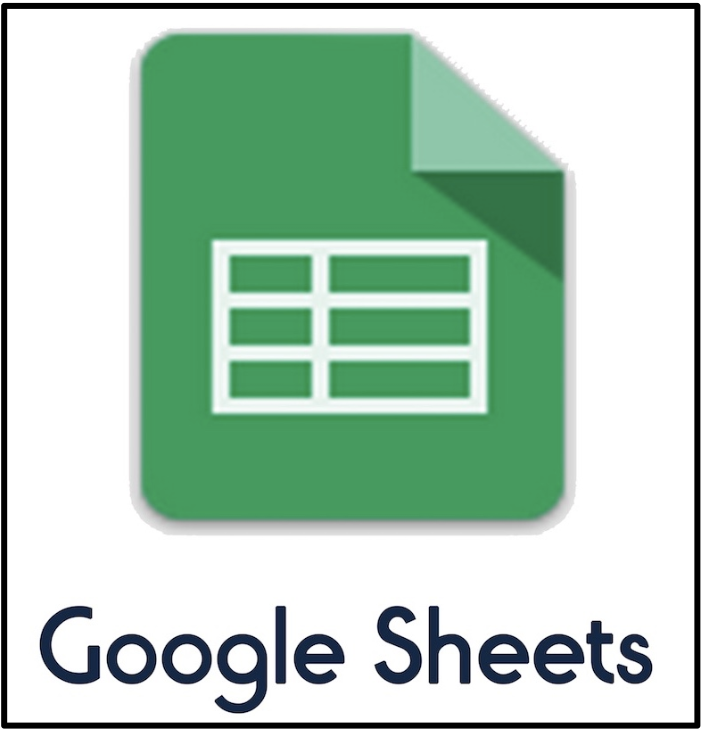 This entry was posted in Google Apps, Instructional Technology, Patrick Cauley, tutorial and tagged Flippity, google sheets, Google Translate. Bookmark the permalink.